After ‘reuniting’ those from ACS, Anderson and NTPS Pasir Puteh……we’re now calling out to the “Sons of St Michael’s Institution ” ! Sadly, Peter had already passed away from cancer…. Hi Sally, yes, sad to confirm that Peter Looi has passed away due to cancer. His wife’s name is Rosemary. Is that correct? Charlie, yes, Peter’s wife is Rosemary and she’s coping very well and keeping busy in her food catering business in KL. One of the sons is studying here in Adelaide. Hi Sally, good to hear Rosemary’s doing well! Have not met up with her since Peter was based in Ipoh, many many years ago. Don’t know if she remembers me. Anyway, merry Christmas to you and to Rosemary and family, if you are reading this. Oh, by the way, in the picture above, I am on the extreme left, standing at the back row. I did not have a Christian name back then. Only adopted the name “Charlie” when I went to study in England. Those English just could not handle Chinese names. Is Lau Swee Mun (17) the Principal of SMK Pasir Putih, Ipoh? Merry Christmas and best wishes for the New Year to you as well, blessed with good health always. I have not met up with Rosemary yet during my visits back in M’sia…have too many relatives, and, always seemed so rush for time to fit into the schedules…. As I’ve mentioned, she’s also rather busy with her business, so, it’s difficult to ‘catch’ each other………. Sorry, UV@Valiant Knight, not too sure about Lau Swee Mun. Hardly anybody from the above class are in Ipoh now! Hope other readers can answer your question for you. I wa in ACS Teluk Anson in 1950 Senior Camb. Class 1950. There is a photo of this. I remembered you well and your last day at Std 6D when you had a football with all the signatures of this class on it. You left for England. I was in England ’77 to ’80. Sad to hear that Peter Looi passed away. I saw Mrs. Hwang photo in the obituaries.I still have the cutting.I believe she is related to you? Lionel is in Ireland, MD of HP! !.Use the ‘Google search’by typing the names and you will be surprised! A joy to have known you-Chong Wee Cheng. David Andrew, I have sad news for you. Mrs Virginia Teh (Au Yeong Poh Wah) passed on either in 2009 or 2010. Yes, I know her as a friend and she is exactly what you described her to be as a teacher and also a friend. Where are you guys now? Give me your phone contact and keep this blog going. I wish to reach most, if not all, what Charlie had started. Thanks. Good to see Lau Swee Mun having such an impact in Ipoh esp with young minds. What a responsibility!! I remember Bernard Lee as well. Petit at that time. Am glad to hear about you guys. Please contact me at +6017 311 6889. If I do not answer, I go overseas for a month at times. Just keep at it. Miss you guys. God Bless. Stumbled upon this treasured post. I was part of 6D, Pry2. But i could not locate myself in the pix .. haha. Mrs Hwang, in std 5d, was my savior and inspiration. I will miss her. She also carried a small hammer in class. Had numerous encounters with that hammer, haha. When I fared badly at her tests, she would hand me the hammer and I was required to pound my own fingers. 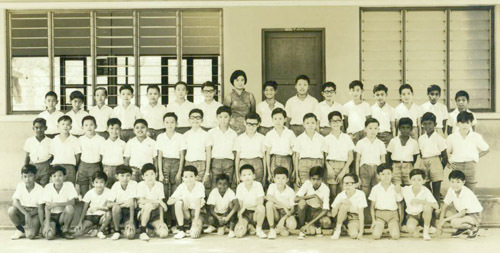 I am looking for my old classmate, Mr. Andrew Voon Chee Meng who transferred to Tunku Abdul Halim Primary School, Alor Star from Ipoh in 1968/69. I thought he was from St. Micheal Institution. Much obliged if anyone who knows his whereabouts, please get in touch with me. My name is Hoe Chee Hee who used to lived in Jalan Tambang (Kanchut), Alor Star.